Your old truck is assembled with valuable metals and recyclable materials, which can come from many corners of the globe and can be recycled in a myriad of different ways. Typically, the vehicle is sold to a scrapper who junks it and sells the scrap for cash. However, with Auto Recycling, the truck is painstakingly disassemble, the parts rebuilt and restore, with the possibility of cycling the vehicle back into use. Hazara Car Removals recycling service is an innovative and ecologically sound way of disposing of your old truck. After disassembly, parts are separated into usable and non-usable, and replaced only as needed, resulting in less reduced cost and pollution associated with manufacturing new equipment. This results in a much great working life of a piece of equipment that would have been destined for a scrapyard. Recycling a truck helps in keeping the cost of production and manufacturing down initially. Enabling an interchange of parts between vehicles, the manufacturing costs drop due to less demand for specialized parts, saving even more money in the long haul. There are many options available to you to drop off your truck, and get an estimate for a rebuild/refurbish, at Hazara Car Removal. We operate locally, in the Melbourne area, and have been a leader in the automotive industry for more than 10 years. Recycling automobiles and parts has become a huge industry in recent years. Rising manufacturing and production costs have driven the parts industry into its own sphere of influence, which is separate from that of a car company. Hazara Car Removals’ recycling service makes money by taking old, barely usable parts and transforming them into factory-grade. This allows for a far more economically and environmentally sound investment, with no need to manufacture new parts. The costs associated with recycling your old truck with refurbish parts is a fraction of what a new vehicle would cost. Feature in the cost of mining ore, refining said ore to fabricate in useable pieces that can withstand the tremendous heat and pressure of a working internal combustion engine, and all the labor this entails, and the cost/yield ratio is far superior to that of buying new. With the reduced carbon footprint left by the recycling process, the choice should be simple, reuse your old truck for a fraction of the cost! A junk car in your backyard and garage is something that you don’t wish to see again once you have a great car. The only solution is to take it off from your place before it start creating problems for you. Now you must be thinking how you can make it possible alone? The best way is to contact some junk car removal company that can complete this easy task for you. They will take care of everything from initial negotiation to junk car removal from your place. The good news is that you will get handsome amount for the scrap which is a pleasing option in exchange of waster material. Hiring a junk car removal company is a time saving process and you will get good price instantly. The first factor you should check is accessibility – the junk car removal company you are going to make deal with should be easily accessible either online or offline. If it is closer to your area then you can expect good price for junk car as it could save your extra transportation charges. It will take only few minutes by the company in junk car removal process. The next step is to check the effectiveness and efficiency of the Company. How you will get to know either Company is efficient or not? The best idea is to place a quote and check either they are giving reply within 24 hours or not. On the basis of their response time, you can easily check effectiveness and efficiency of the Company. At the end, it is necessary to check how much you will be paid for your scraped car. It is not state or class of junk car that will decide the price but the Junk car removal Company. Make deal with the Company offering best prices for your old car. In case, you are not happy with the given amount then you can look for other sources immediately. With all these consideration, you would be able to pick the best Junk car removal service only. Now you can make good money with your junk car instead of letting it waste of space or eyesore. In a long list, one of the best picks is Hazara Metal recyclers that assure best junk car removal services for the customers. The Company is also giving free scrap metal pickup and collection facility. You will definitely get desired cash value at Hazara Metal recyclers. Give us a free call or contact us personally. If you are currently shopping around for vehicle history report providers and you have come across instaVIN, then you may want to continue reading the content on this page. You will be able to find some helpful details on the five year old company based out of San Diego, California, learn why they are better than such major competitors as CARFAX® and AutoCheck® and where their car data comes from. The first thing that you may find appealing is the fact that they don’t only offer their valued clients top notch vehicle history and title reports, but their menu of products and services also includes bill of sale document services, a finance center, vehicle service protection, a certified pre-owned auto program, a certified pre-owned powersports program, a free record check and VIN decode, a free mobile application for your iPhone and iPad and more! Up to 24 vehicle specifications: including the car’s year, make, model, fuel type, transmission speeds, plant and more! Junk, salvage and loss data: including the date, entity, disposition, whether it was intended for export, the damage type and data source. Title information: including the date, the state of title, mileage and event. Odometer data: including the date reported, mileage, problems solved and data source. When you choose instaVIN as your provider, you will likely be impressed by the total reliability and accuracy of every single report you download through their user friendly website. This is due to the fact that they compile their car data from the top sources, unlike their major competitors who are notorious for providing outdated and misleading reports at a costly fee. instaVIN uses top sources which include the National Motor Vehicle Title Information System (ie: NMVTIS), the state DMV, police records, fire and insurance records, data aggregators, and many other proprietary sources. The NVMTIS is one of the most dependable and in-demand sources because it is the only vehicle history database in which every state, insurance carrier and junk and salvage yard are required by federal law to report their data accurately. That database is also administered by the American Association of Motor Vehicle Administrators and overseen by the US Department of Justice. To learn more about how the fantastic and reliable company, instaVIN can serve your needs today, give them a call directly at 858-454-6782 or visit their websitewww.instavin.com for more details on their products and services. Owning a car these days is a costly endeavor in more ways than one. In terms of individual finances, the steady rise in gas prices has been wreaking havoc on every driver’s budget. Moreover, regularly filling up a gas tank is not the most environmentally sustainable practice, as it depletes an already diminished supply of natural resources. Improving your car’s fuel efficiency through one of the following ways, however, can help to partially address these problems. Taking the time to check your tire pressure and make sure that they are appropriately inflated can have a significant effect on your car’s fuel economy. Under inflated tires tend to drag on the road, causing more friction and requiring your car to work harder to reach certain speeds. Inflating tires properly can increase your fuel efficiency by up to 10%. It’s also important to make sure that your tires are properly aligned and regularly rotated, as this too can improve fuel economy by around 10%. Replacing spark plugs can also improve this efficiency; in fact, misfiring spark plugs are one of the most common causes for reduced gas mileage. 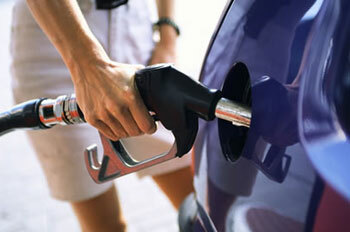 Do you regularly fill up your tank in the middle of the afternoon or early in the evening? If so, you may be unwittingly decreasing your car’s fuel economy. During the warmest parts of the day, gasoline loses some of its density, but becomes denser when the temperature cools down. Thus, it’s a good idea to fill up your gas tank at night or very early in the morning, since at these hours you’ll get denser (i.e. more) gas for your dollar. It’s also important to use the grade of gasoline recommended for your particular vehicle. While it may be tempting to pay less money for a lower grade, you may end up paying more in the long run when your fuel efficiency decreases. Reducing your average driving speed is also a good way to improve your car’s fuel economy. A car reaches its optimum fuel efficiency at around 55-60mph. Once you start driving faster than that, your fuel efficiency will decrease, forcing you to fill up your tank more often. Driving at reduced speeds can be difficult if you take the freeway to work every day (especially if you tend to run late), but if you can manage to do so for at least 2-3 days each week, you can still significantly improve the fuel economy of your vehicle. Additionally, using a cruise control option if available (and when possible) can also improve fuel efficiency by up to 15%. There are a number of other small changes you can make to your driving habits which, when combined, can greatly improve your fuel economy. For example, avoid idling when running errands or picking up and dropping off children from school, as this simply wastes gas. Additionally, if you’re carting around a lot of equipment in your trunk, try to unload some of this, as a lighter vehicle gets much better fuel efficiency. About the author: Samuel Hoyt is a freelance writer and an enthusiast car owner. He usually writes articles related to sell car online and other automotive topics. Being an automotive enthusiast can be a lot of fun. All those car-talks, meet ups and car cruise. However, the main thing we all commonly like to do is to work on our cars, or help out friend’s cars. Most of us don’t mind getting our hands dirty for our cars but the only issue with our own projects and builds is lack of knowledge & technical data. Without the exact specifications and figures, you could mess the build or repair up. This can be avoided if you have the correct technical data for your car. A good website for workshop and service manuals is allcarmanuals.com. The website contains database of manuals for most makes and models of cars, although not all are listed yet but the directory is constantly being updated. The website helps you to get information like what tools are needed, for example bolt sizes, how much torque is to be applied to each bolt, diagrams of how to complete specific repairs. There is also a complete description of what routine maintenance the car requires, such as the interval (km's) between oil, changes spark plug and coolant replacement. This type of maintenance information is a valuable tool to keep our cars on the road in the long term, so they continue operating correctly by replacing fluids and parts to factory specifications. The manuals available from the website also contain a lot of information on different areas of the car, such as engine and suspension. Every nut and bolt is covered, every clip and clamp is discussed in the deepest possible details so that you will know exactly what to do and how to get it done. There are also extensive diagrams in the manuals to demonstrate how to do repairs exactly as they are supposed to be done. The inclusion of wiring diagrams also means if you already have a basic knowledge of electronics, you can easily diagnose any electrical issue and narrow it down to the place of origin. Apart from all the very specific, easy-to-understand and to-the-point pieces of information, there is a lot of general information about each car, such as general dimensions, weights, ride height, tyre sizes, and basics like recommended tyre pressures. In short, the manuals available are a very comprehensive guide to your car. You could download your cars manual then place it on a laptop or on your tablet pc / smart phone, then refer to it for reference when making repairs direct from your car. For apprentice and pre apprenticeship mechanics, this can also be of benefit for research and educational purposes. To download the workshop / factory service manual for your car, visit www.allcarmanuals.com. The service is free, website is extremely user friendly with makes and models clearly listed along with their photos. The manual is available for instant download from each vehicle model page.